The 16th-century English bibliophile, Robert Cotton, sometimes bound together unrelated manuscripts. This one contains a fragment of an early 12th-century English scientific textbook from Peterborough and an 11th-century pontifical (manual of services conducted by a bishop), part of which was probably made in France but to which additions were made at Sherborne Abbey in Dorset. The scientific textbook comes from two types of sources. First, an early medieval natural science tradition began in the treatises of Isidore of Seville and Bede, and was later expanded by Abbo of Fleury, who lived at Ramsey in the 10th century. The second part is a copy of a late Roman version of Cicero's latin translation of the poem by the Greek writer Aratus on the constellations, known as the 'Aratea' and which probably had a long tradition of illustration.Monks and churchmen used the textbook in their theological training. Annals in another part of the book giving the death dates of Peterborough abbots and the handwriting's similarity to that of the Peterborough Chronicle (at the Bodleian Library, Oxford) place the manuscript's origin at that monastery. 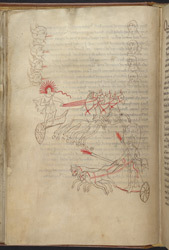 In the centre of the page is Helios, the Sun god, (or perhaps his son Phaeton) driving his chariot drawn by four horses, and below him is Luna, the Moon goddess, with her chariot drawn by two oxen. The male heads at the top left represent the four winds, and the four female ones to the right may represent the four seasons. Close inspection reveals that the latter group have been erased and re-drawn, perhaps because the original drawings represented them as males.